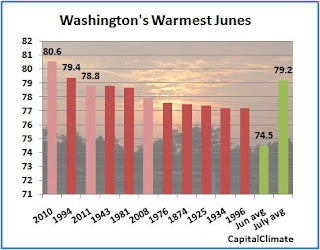 July 1 Update: The preliminary National Weather Service monthly climate data report confirms the Washington June average temperature of 78.8°, tied for third hottest. Two out of the top 3 hottest Junes, and 3 of the top 6, have been in the last 4 years (2008, 2010, and 2011). Only 1 of the top 5 has occurred prior to 1981. The high temperature for the month of 102° tied the all-time June temperature record. There were 10 days with temperatures of 90° or higher. Only 1 day failed to reach 80° (78° on the 14th).